Do you like coffee as much as I do? Everyday coffee just doesn't feel awesome anymore? Let me tell you why. You are not preparing the coffee with your entire concentration. Yes, you heard me. You are always distracted in some other work while making your coffee. Don't believe me, try this the next time you make your coffee. Clear your mind and grab your favorite coffee percolator and concentrate on how exactly you want your coffee. Do you want strong or sweet coffee. Put your mind into it and prepare the best coffee of your life every single time. In this article I am gonna help you choose the best coffee percolator out there. Also, some interesting facts about percolators. Keep Reading. 2 What is an Electric Coffee Percolator? Percolators are being used from long time. People will think you are still back dated for using percolator off and want to have a percolated cup of coffee, but let me tell you one thing - You can't find better cup of coffee than this one. Sir Benjamin Thompson invented percolating coffee pots around 1812, but the first patent for coffee percolator was done in 1865 by James Nason. Coffee Percolators found their popularity within 5 years of its patent. Almost every American back in 1970s had some kind of coffee brewer in their home. With further advancement in technology electric coffee percolators were introduced around 1990s are still hit to this day. What is an Electric Coffee Percolator? An electric coffee percolator is device which will brew coffee for you within a minute. Water passes through with coffee and gives your coffee an aroma, color, and taste. Normally these percolators work in very simple manner. Every time the water passes through the percolators, it takes more oil from coffee and makes it stronger. 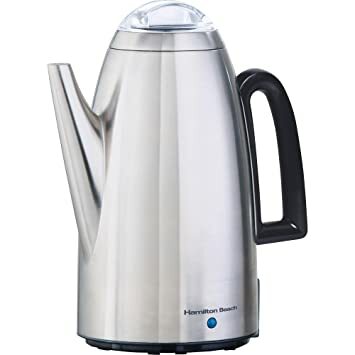 Farberware FCP240 cup percolator is one of the best that Farberware manufactured. It has a rating of 4.1 out of 5. Previous buyers have said they are really impressed by its size and performance. After buying the product they found that Farberware electric cup percolator is very easy to use. Some commented that this red coffee maker cup percolator can’t make strong coffee while others said it can make the best coffee they ever had. And almost every person said that cleaning this electric coffee percolator is easy and it can brew hot tasting coffee instantly and consistently. It can brew 2-4 cups of coffee as well. It has measurement of 7*7 *9-1/2 inches. It brews per cup of coffee within a minute. It automatically switches to keep warm mood. It has a detachable cord for serving. It has a cool touch handle with a lid knob and rolling edges. Its capacity is up to 4 cups and 1000 watts. Farberware FCP240 electric Coffee percolator with timer is great to serve the guest. It is easy to use and convenient to serve. Percolators can extract the maximum amount of oil from coffee by overheating it with the grounds continuously. 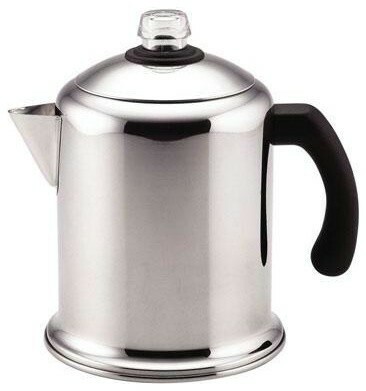 This Farberware FCP412 cup percolator is for those who like their coffee very hot and strong. This awesome coffee maker is very convenient to use. It has a rating of 4.3 out of 5. This electric coffee percolator is very small in size with sleek style. It is standard for standard desk drawer or small offices. This percolated coffee making machine does not make the coffee taste bitter or burnt by re-heating. You can also control the strength of the coffee by this red coffee maker cup percolator. 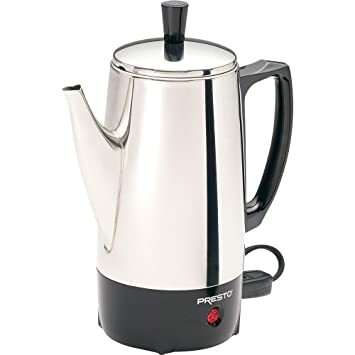 If you choose this cup percolator you will get one year warranty. It has measurement of 8*8*15 inches. It brews 12 cup of coffee per brew. It automatically switches on to keep coffee warm. Farberware coffee cup percolators are heavyweight stainless-steel appliance with a very innovative design. It offers you the adjustment of lighter or stronger coffee with a detachable cord. And for this reason they have loyal customers who support their brand and production. It does not matter you like strong or weak cup of coffee. You can adjust the brewing time of Cuisinart PRC-12 and can get your coffee like your desire. It has a rating of 4.2 out of 5. After you finished brewing it automatically turns to keep warm option. It can brew two cups of coffee as well. This electric coffee percolator is best for small office. Both 240 and 280 have rolling edges with lid knob. You can use your percolator for everyday use, party, and official uses. It has an elegant shining stainless steel surface which can fit in your kitchen decor. It is also perfect for office party and special occasion. Who does not love hot coffees without burnt taste? If you are at your house entertaining a friend or with group of friends, this cup percolator is best for you to increase your fun or reactivate your mood. It has measurement of 6.3*9.2*12.2 inches. You can have 12 cups of coffee within 5 minutes. Make sure not to boil the water and try to keep the heat lower. You will still get a bounce of bubbles in your cup with a great taste. Too much heat may burn the taste of your coffee. Many people like this percolators very much since its a best seller. It is very famous for sportsmen, hikers, and outdoors men because they don’t need any kind of heat or electricity to make coffee. If you are in these categories of people then you can enjoy a cup of coffee from cup percolator sitting inside the tent by the river side. It has a rating of 4.7 out of 5. You can also enjoy the glamorous beauty of nature too. You can also carry the lightest one if you don’t want it too much heavy to carry. This electric coffee percolator is one of the leading brands in the world and also a reliable manufacturer too. It has measurement of 13.1*9.7*6.2 inches. Many people like cup percolator in their homes and they get also used to it. You can carry this cup percolator in your bags, car, or anywhere and enjoy the coffee in the desired place you want. Percolator coffee is very strong and bitter in taste but no worries. I have mentioned previously that you can adjust it by your percolator. You also have to clean your percolator regularly to get a fresh coffee. It is up to you to decide the best cup percolators. The taste of the coffee depends on the quality of the beans that you use. Don’t be tired of boring coffee and check out our Over the range Microwave review as well. Spend your money on the best percolator and beans to get a fresh cup of coffee within couple of minutes. Buy the best electric coffee percolator by watching the features, price, and the size too. This red coffee maker will save your energy and space too. It is very convenient to and easy to use.